Ships Log "03.00 Reveille. Wash & pack. 04.00 Breakfast. 04.45 Gear loaded into lorry. 05.00 Marched to railway station. 05.40 Arrived at railway station, to find that train not leaving till between 8-9. Another air-raid warning was in progress. Left Escape party officers signed Yuan banknotes as souvenirs while waiting on the train. 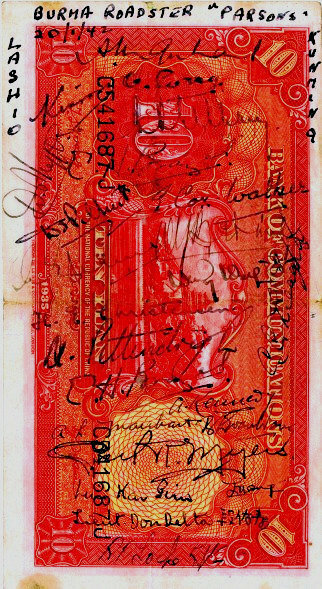 Click on the image to see whose signatures have been identified. A7 7pm Admiral Chan Chak made a radio broadcast on 'The Youth and the Hong Kong Fighting' in which he praised the British troops defending Hong Kong. 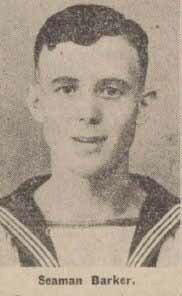 Chan went on to recount his dramatic escape with the 2nd MTB Flotilla and again praised the Royal Navy party who protected him while behind enemy lines. On arrival at the railhead at the walled hill city of Ichang the party embarked upon four trucks Gandy had hired at a cost of ROC$80,000 borrowed from the Adjutant-General, IVth Chinese Army while in Liuchow. It was a two day journey through the mountains to Guaiyang. Fine rain makes the dusty road treacherous, sometimes with no barriers even on the many S bends. There was much traffic and lines of Shetland like ponies with bells. L/S Les Barker "Dawn start, on the way to Kwei-Ang. The road is very treacherous, covered with a layer of mud and all the time we are climbing. Raining very fine rain so it doesn’t give the road a chance to dry up. Plenty of traffic on the roads, and we also see Shetland ponies with bells on their heads. Sometimes these ponies were 40 or 50 in a line, led by one or two men. We were skidding a lot this morning on this murderous road. 1015 – And our lorry failed to negotiate an ‘S’ bend and, before we knew what was happening, we toppled over, taking a complete turn and a half. Luckily we only had four injured, but if we had gone over once more there was a drop of 100 feet and we should have all been killed. After, the lorry was hauled back to the right way up and, after treating the wounded and getting them away in another lorry, we piled back into the same lorry and proceeded again to Kweiyang, very much shaken by our experience and leaving the road littered with eggs and oranges. Ships Log "On at 8 am. Truck with Lt Collingwood overturned some 90km from Kweiyang. Three or four casualties—not serious, one with fractured collarbone. Last truck left Tuckshan at 6.45 am. Arrived Maclongping At noon; sick man put in ambulance. 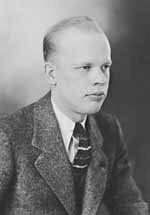 Sub-Lt Legge HKRNVR "My truck, which was second in the convoy had about fifteen men inside with me in the back between two fifty gallon gasoline drums looking out backwards. My Captain (Collingwood) was in front with the driver. Going round a steep corner, we started to skid. On the off side was a drop of several hundred feet. Luckily we hit a large stone at the outside of the road, turned around across the road and turned over. I didn’t realise what was happening until I found myself sitting in the mud in the road with the truck on top of me. The truck had only iron hoops and a canvas cover and we would all have been squashed had it not been for the fact that one of the gasoline drums fell on end with the end of the truck sitting on top of it. We were in a pretty pickle, 80 kilometres from the nearest telephone, sitting in the rain and mud and no way of getting immediate help. Then as I was attending to one of the men who had a deep cut above the eye, he pointed out that blood was pouring down my face. There were two other men fairly badly hurt, but except for extensive abrasions we couldn’t find out what was the matter. Then luckily the next truck came along. We transferred the wounded into that and with myself in the front set off 80 km. to Kweiyang where there was the nearest hospital. It was a terrible ride as not only was the road very bad with all the rain that was coming down, but the wounded men were in rather bad shape. After clearing the Tol Post at the Guiyang city gates the party obtained directions to the Head Quarters of the Red Cross Society of the Republic of China in Tuyunguan high up in the mountains above the city. The society could be traced back to its foundation as The Shanghai International Red Cross Committee formed on March 10, 1904. The Society migrated to Formosa, now Taiwan in 1949 and is still maintained there today. The first two trucks arrived at 14.00 and were met by Dr Robert Lim. Left: Dr Robert Lim seen here with Lt Cuthbert J Collingwood RN, was a Lieutenant-General in the Army and Surgeon-General of the Republic of China. He was a long standing friend and former golfing partner of Admiral Chan Chak. The forty four year old Lt-General known by all as Bobby, had drawn up a schedule of events ranging from official functions, cinema shows, boating to football for their three day stay. 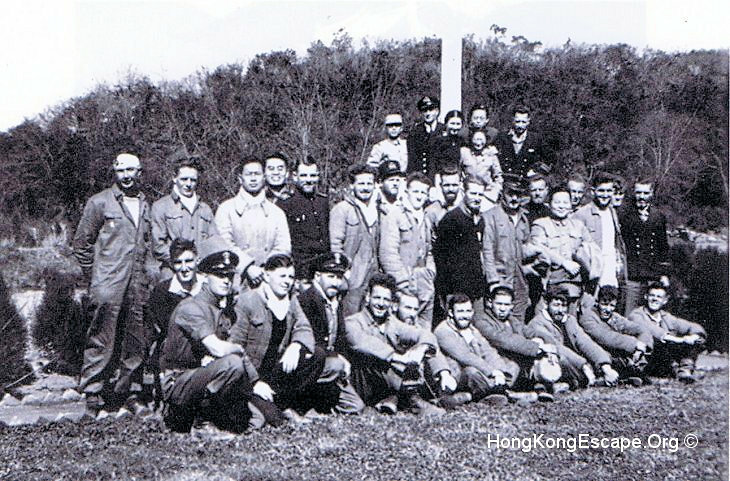 As well as two European Physicians known as the Spanish Doctors, there was also a US Army surgeon with the American Military Mission to China (AMMISCA). General J W (Vinegar Joe) Stilwell of the US Army presented him with the "Legion of Merit." one of the USA's highest honours. In 1939 a team of European doctors had been recruited in London by the China Aid Committee. Among them were an Austrian, Dr Fritz Jensen and a German, Dr Rolf Becker. Both had escaped from southern France after being incarsarated following the Republican fefeat in the Spanish civil war. The following summer they were in Hong Kong collecting medical supplies to transport to the Chinese Red Cross HQ near Guiyang. While in Hong Kong Rolf Beckecker met twenty six year old Joan Staniforth, employed as a nanny by Percy Selwyn Selwyn-Clarke, Director of Medical Services in Hong Kong. 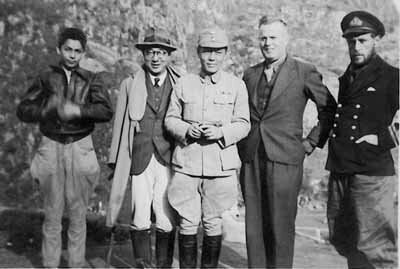 Joan was keen to see more of China and resigned position, joining the doctors on their expedition. Led by a Mr Ray, an old China hand, wearing a heavy canvas suit and pith helmet the party sailed to Macao. Both doctors were travelling on Spanish pasports. Graham Peck "The leader of the party was an elderly Texan missionary from Kwangsi Province, who spoke rapid Cantonese with a high Panhandle accent and had made the trip several times before, running church litriture and canned goods through the blockade. This trip he was escorting half a dozen Chinese Christian virgins whose families had decided they would be safer in the interior even though they weren't pretty. Also with him were an English girl, an Austrian doctor, a German doctor; all in the Red Cross. In Macau they negotiated with a gang of people smugglers for a fee of HK$35.00 per person, a little over two English pounds to cover all expenses including ransom fees en route through the pirate infested inland water ways. They became aware that the army, police, pirates, and smugglers seemed to be in cahoots with each other. At Tam Shui Ko the party split up with the medical party embarking on trucks to complete their journey to Tuyunguan. Joan took on the role of secretary to Dr Lim and tutored his daughter Effi who was a reuctant student. Lt Ron Ashby arrived later by ambulance. The medics attended to the party's injuries to the best of their abilities while Lt-Cmd Gandy procured funds which enabled the party to do some essential shopping. They were billeted within the hospital complex. Dr Grindlay 1st Lt US Army " The overturned truck came on a little later than first 2 & it was evening before Gandy & several officers & a sick man [Ashby] with] suspected typhoid came on. Altogether 16 officers, rest "ratings" Brewer, Legge, Collingwood, Kennedy, Gee, & Parsons were younger officers. 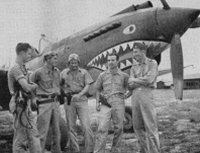 Dr Grindlay 1st Lt US Army " I am sure the arrangements pleased the men, also sure they didn't know at what effort that had been arranged, & the cost of things procured -- as the entire Chungking gin supply of Bobby's (Dr Lim) they drank -- Dr T F Chang -- "They drank 16 catties (1 1/3 pints) of mine." 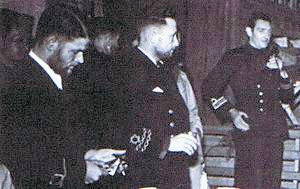 Lt-Cmd Gandy RN accompanied by Lieut Pintendrigh RNR, and Sub-Lieut Brewer HKRNVR giving a speech in Guiyang. The party were given the freedom of the City after a speech by General Wu at the City hall and each was given a card showing the primitive life of the Chinese tribes, sealed with the Governor's private seal and signature. At 4 p.m. they had a cinema show put on by the Red Cross followed by a few sketches put on by the navy party which brought hoots of laughter. Dr Lim offered the use of his Red Cross trucks to transport the party to Kunming, the Chinese end of the Burma Road as they were driving there empty to pick up medical supplies. Major Goring, still in Kukong, had now recovered from his malaria attack. Lt-Col Harry Owen-Hughes and Dr Moore took him to the station where he proceeded by train to Kweilin and from there by air to Chungking. Visit to Local Park at Huaxi followed by soccer match in the afternoon, losing 6-1 against the Red Cross training school. Also in the afternoon a visit to the British run "Friends Ambulance Brigade" that was passing through Guiyang on their way into China. Kennedy soon spotted a fellow Scot, Andy Braid, who it turned out had his pipes with him. As it was Burns night they took turns on the pipes. Kennedy spotted a fellow Scot, Andy Braid, who it turned out had his pipes with him and it was Burns night!!. Lt Kennedy RNVR "I met a Scotsman in the wilds at the back of beyond. He used to go out into a rice field and play his bagpipes, to the great amazement of the local children and hordes of mongrel dogs which joined in the chorus. The hut we were in was a small one and very soon indignant protests from the other members of the party forced us outside. It was getting dark as we played in turn along the edge of a paddy-field, some of the old marches from school-days, Barren Rocks, Pibroch of Donald Dhu, and the poignant notes of Loch Duich. In the evening they were all invited to a farewell dinner laid on by the Governor, who unfortunately was unable to attend. A very enjoyable evening was had by all with much local rice wine being consumed with much singing and many shouts of "Kan-Pi." Lt Kennedy RNVR "By chance it happened to be 'Burns Night' and before Dr Lim moved on to the next table I quoted a few lines which I could remember from 'The Ode to Haggis'. This he capped at once by reciting the next two verses much to everyones astonnishment. David MacDougall MoI "In Chungking there was a great deal that I was duty bound to do – address meetings, give interviews to the press, and write articles. One of the latter is I think being syndicated in U.S.A. by the N.A.N.A. I could have cashed in to the tune of $2000 or more if I’d accepted some of the American offers for my story. David MacDougall MoI was resting and having more X-rays in Chungking before being flown to Chengdu in Sichuan Province, where the university run hospital was considered the best in all China. Luckily for most it was a late start for Kunming, leaving at noon, with Kelly & Deakin in hospital recovering from the lorry crash. It had been a very enjoyable few days with a distinctly scottish flavour topped off with a considerable amount of local alcohol. L/S Les Barker "We had a big farewell breakfast, then off again at 11am. The convoy under the command of Doctor Wong was going out empty to collect medical supplies, and so was available for the escape party on its outbound journey. 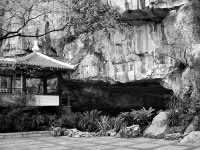 With Lt Ashby now fit enough to travel they made their way down the hill towards the city of Guiyang, picking up the main Chungking to Kunming highway, The Burma Road. The road across the plateau was extremely bumpy passing through many gated & fortified villages, with the ever present choking dust in the open ended trucks.The drivers were much better than the party had experienced in the past, stopping hourly for refreshments, which also aided in keeping the convoy together. David MacDougall endured a two and a half hour operation at the West China Union University Hospital in Chengdu which failed to extract the bullet lodged under his shoulder blade. David MacDougall MoI "I am up here for a few weeks for rest and patching up. As soon as I arrived here I got a decent X-ray on me and they found the bullet under the left shoulder blade, jinking about among my ribs. It had smashed through the shoulder blade and was fairly deeply embedded. An early start was anticipated by the escape party in Anshun but the Chinese saw to it that did not happen. The dust was as bad as the day before, but with the sheer drops it was preferred to rain which would have made the journey suicidal. Later in the day the road descended into a gorge and crossed the river on temporary pontoons after the steel bridge had been bombed just two weeks previously. Then it was uphill, this time higher than before, at one over-night stop Gandy set a watch as bandits and brigands frequented the route. After debriefing Major Goring flew to Calcutta's Dum Dum Airport where he was hospitalised again before making his way to Delhi where he was promoted to Acting Lieutenant-Colonel and resumed his intelligence duties in the British Indian Army HQ. The party arrived at the massive ornate gates of the walled city of Kunming the capital of Yunnan province 6,500 feet above sea level in the Wuliang Mountains and contacted the British Council who arranged quarters 5Km up Burma Road. Here they met the 1st contingent of Australian/British Marines of the 204 Military Mission who had travelled up the Burma Road from The Bush Warfare School at Maymyo run by Brigadier (Mad Mike) Calvert. They were on their way to Kiyang to join the 5th Battalion commanded by Lieutenant-Colonel Chen Ling Sun. 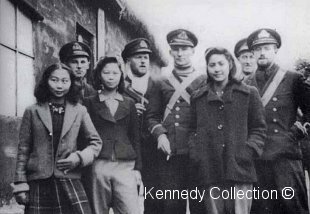 Under the top secret code name of Tulip Force they were to train the Chinese in commando/guerilla tactics against the Japanese. The party swapped their Chinese supplied padded padded jackets they had worn all through the mountains with the commandos for khaki shirts and shorts. An enjoyable 28th birthday was celebrated by Buddy Hide, especially as western food was available at the hostel. Jardine Matheson & Company the international traders and shipping agent had an office here, some seven hundred miles inland from Hong Kong. The agent, Mr Urquhart, was more than keen to to employ Eddie Brazel and other interested former employees. They were needed to staff new inland regional offices being set up due to the loss of China's southern ports. The demand for silk was at an all-time high, not for the luxury hosiery market, but for parachutes. The British Embassy in Chungking ordered Lt Pittendrigh, Sub-Lt's Gee & Legge to fly to Chungking to work on cipher material. Five and a half weeks later Lt Pittendrigh was seconded into the British Indian Army with the rank of 1st Lieutenant. By the war's end Pittendrigh had risen to the rank of Major. Kunming was very cosmopolitan with a lot of French influence in some of the architecture. Ahead lay the most famous road in the world, China's lifeline, the 684 miles [1100 kilometer] long Burma Road, connecting Kunming, high on the Tibet plateau with Lashio in Burma where the railhead is located. These were Australian/British Marines of the 204 military Mission who moved out heading for Kiyang.